I learned a hard lesson! I thought be throwing a tarp of it my boxes of siding material would be kept dry. I forgot that the boxes were lying on the ground. Consequently all the boxes were wet - some so wet that they fell apart. 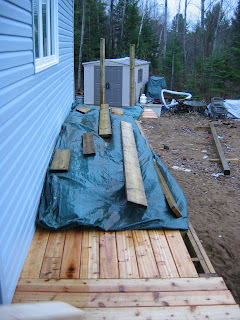 So we moved the siding material up on the deck for the winter and placed the tarp over them. I have been careful in placing all my wood deliveries, by placing them all on waste wood so that they were off the ground. My my mind must have been turned off the day that the siding arrived. Often the material will already be on a pallet or delivered on 4x4 support boards. Ask to keep them - and use them to place under your materials. Be sure to put plenty of support under your materials. Every 2 feet if you have enough waste lumber. My big mistake with the siding material was not using the scrap 4' x 8' material I had to support the boxes - and I had quite a few of them. This way the boxes of siding would have been protected from water seeping up from underneath. I fortunately purchased a number of tarps of different sizes knowing that I would not be using the materials as fast as it arrived. If any of the lumber and other material stick up they will just wick water under the tarp. Another reason to cover your material, even the lumber, is to prevent warping. If the wood drys out in the summer sun it will likely warp. Warped lumber is a pain to work with. Keeping it covered slows the drying process, and keep the lumber straight. One of the yard workers at Dale's lumber yard shared with me a neat trick. If you have say a large number of sticks of lumber, say fifty 2" x 6" by 10', laid out in a stack 5 deep by 10 across, it is better to take the lumber as you use it in a vertical fashion. That way the lumber stays straighter.